The walking life is a pared down life. Major issues are few, and usually surround necessities like navigation, food, weather, shelter, bodily fitness and function, and the avoidance of hazards. When most of those are humming along, then you can begin to take in the beauty. You might even get philosophical about walking. 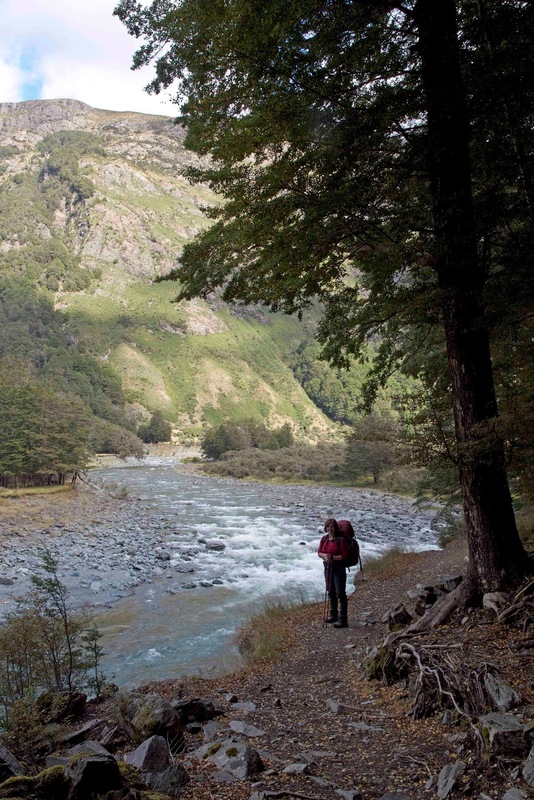 For instance, whether you prefer to walk upstream or downstream. On day one of New Zealand’s Greenstone/Caples Track, things are going well enough for us to make that a topic of discussion. We’ve got away in a leisurely fashion, and are happily easing our way upstream along the beautiful Caples River towards Mid Caples Hut, only three or so hours away. Perhaps our mood is partly a response to our unfortunate prior history with this walk. Eighteen months earlier we’d been scheduled to walk the same track. But Lynne had come down with a case of shingles so severe she’d barely been able to turn over in bed, let alone bushwalk. We were later advised she probably should have been hospitalised. The four day Greenstone/Caples walk takes in two broad, mountain-rimmed river valleys. 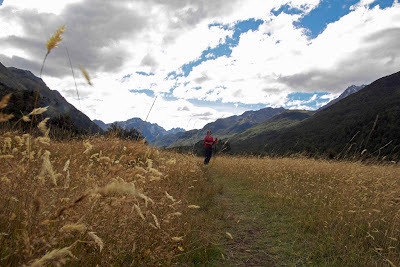 It loops up one valley, over a mountain saddle, and back down the other valley to the starting point. For us the walk has become, in a real sense, unfinished business. Like the Pacific salmon we had once witnessed swimming up Alaska's streams, we have returned across the ocean to be here. If just getting to the start feels like a triumph, the real reward is in keeping on going, mentally as well as physically, against the flow. Once we’re into a walking pattern, with packs and boots settled in, the sheer beauty of the surroundings compounds our joy at being here. 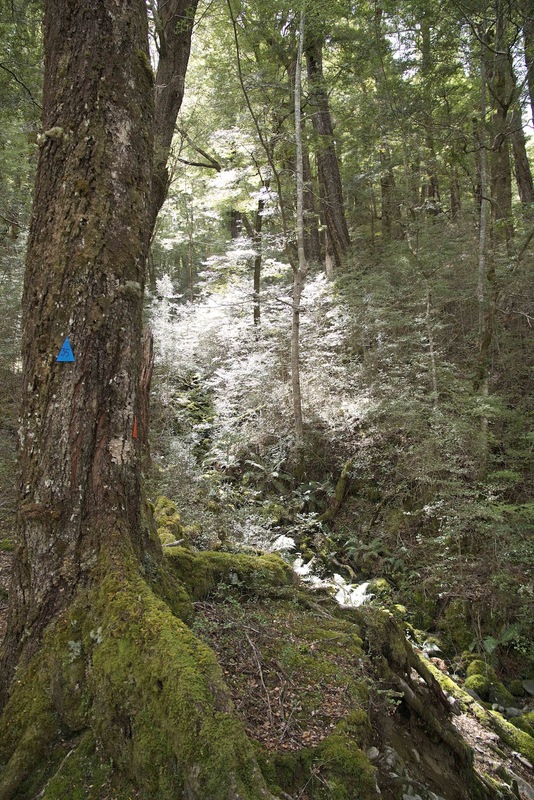 The Caples Track initially winds through mature red beech forest: one minute high above the blue/grey river, the next dropping close to the stream, nearer to its chuckling conversation. Our mood is further improved by the weather. Just a day before we’d met some returning Greenstone/Caples walkers, and they’d talked about having to cross flooded side streams in the upper Caples. For us the rain and clouds are receding, patches of blue sky are promising better, and what side streams we meet are friendly. They fit one definition of the word burn: “a stream across which one can leap”, and certainly with no Superman-like “single bound” needed. At various times the track breaks out of forest onto grassy river flats, complete with cattle and sheep. Here the views open out, and the surrounding ranges – the Humboldt and Ailsa Mountains – dominate the view on either side. The day before they must have been shrouded in cloud, and lashed by rain and even snow. This day they stand as though resting between games, poised to resume their rock-tearing when the right weather returns. We appreciate the benign conditions. These mountains and valleys are geologically active by Australian standards, with ferocious floods and avalanches most years. Mountainsides, watercourses, tracks and even huts can’t be guaranteed to stay put in this young and mobile country. We’re reminded of this again during our time at Mid Caples Hut. We arrive for a late lunch, and are greeted by the hut warden. After she checks our hut passes, we get talking and find out that she’s from Christchurch. We ask her about last year’s earthquake, and get back the kind of story we will hear in various different forms many times over the next month. After her shift she is due to return to her place in Christchurch. It will be the first time in 12 months that she’ll have full access to her home. That’s almost a whole year of suspended living, basing herself with family and friends, unable – literally – to pick up her own life and move on. Some streams are much harder to go up than others.